Ø New, Never a Demo, Never Refurbished, Never Used. Ø As an authorized dealer this kit is backed by a manufacturer's 1 year warranty. Ø View other color temperatures Right Here! Our HID kits provide a great value. Our kits are plug and play for a simple installation with no extra parts or modification of any kind needed for most applications. Our kits use the new 7th generation single piece potted ballasts with internal ceramic components for better cooling and durability. All of the key components for our electronic ballasts are imported from US, Japan and Germany, for example, our MOS tube and IC are from IR in USA, PIC is also from USA, discharge tube is from EPCOS (SIEMENS) in Germany, electrolytic capacitor is from Rubycon in Japan. The key components play very important role for the ballast reliability. If you ever need a warranty repair it is handled out of the USA and all replacement parts are in stock. *The above customer photo is of a 6000K kit, which we carry. More customer photos available here. Depending on size kit may look different then below. For applications that run both the low and high beam off each bulb the kit sent will be dual beam so you will not loose any functions. 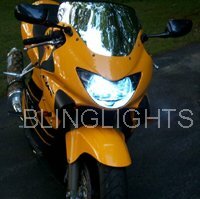 What is the difference between this HID kit and another HID kit selling for much less? Our HID kits provide a great value. Our kits are plug and play for a simple installation with no extra parts or modification of any kind needed for most applications. Our kits use the new 7th generation single piece potted ballasts with internal ceramic components for better cooling and durability. All of the key components for our electronic ballasts are imported from US, Japan and Germany, for example, our MOS tube and IC are from IR in USA, PIC is also from USA, discharge tube is from EPCOS (SIEMENS) in Germany, electrolytic capacitor is from Rubycon in Japan. The key components play very important role for the ballast reliability. If you ever need a warranty repair it is handled out of the USA and all replacement parts are in stock. What is your return policy? Every seller should have a return policy and the feedback to prove it is enforced. Our policy is that for whatever reason you decide to return the item you have 1 week to do so from time of delivery. All that is required for a Full Refund less shipping is to send the item back in the EXACT new condition it was received with your auction item number, email address, and reason for return. That is it, no pre-approval needed. Leaving or threatening to leave negative feedback will void this policy. We only accept credit or debit cards, moneybookers and paypal. Best offers do not include shipping. Payments from unconfirmed paypal addresses will be denied. All payments must be made in US dollars. Happy Bidding and good luck.